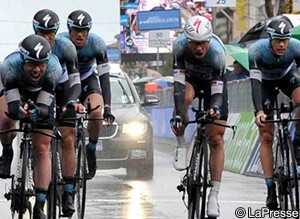 Mark Cavendish (Omega Pharma-Quick Step) became the first leader of the 2013 Tirreno-Adriatico in Donoratico, close to the coast of Tuscany today, and paid tribute to his teammates after an eight-man effort saw the Belgian outfit win the team time trial. The Manx sprinter was the first to cross the line, at the head of the five remaining riders, but was quick to credit those in his team that had made this possible. Omega Pharma-Quick Step is the reigning World team time trial champion, having picked up the title in Limburg, Netherlands, in September; Cavendish was not part of the team that day, but particularly recognised one of the key riders from that day. With Cavendish and Martin at the finish were Niki Terpstra, Zdenek Stybar, and Michal Kwiatkowski, but the former World road champion was keen to emphasise that the other three riders - Guillaume Van Keirsbulck, Gert Steegmans and Martin Velits - had all made their contribution before being left behind on the 16.9km course. “Everyone knew what they had to do,” Cavendish explained. “We finished with five but everyone had a part to play. “Maybe that's what makes us so good, because no one has a real ego except maybe me,” he laughed. “For everybody, it's about getting eight guys from point A to point B as fast as possible. I'm super proud to be a part of it. For me, when there's a team time trial win, it's one of the nicest things in cycling. The whole team gets to celebrate. That's what makes this event special. After a year at Team Sky, which failed to live up to expectations, Cavendish has managed to find his love for cycling again at Omega Pharma-Quick Step, he says. The Manxman has already taken five sprint victories this season, as well as the overall Tour of Qatar title, compared to just three from this time last year. "I'm really enjoying riding my bike again," he said. "I don't know if it's the past or this team is just so nice, but I am just really, really happy. I found a new motivation again. This is my 7th or 8th year as a professional, but whatever happened this year I have newfound love again. “It's just really refreshing to be part of a team where I've got so many friends where I grew up in the past with them and now I'm having so much fun,” he explained. “This is the most I've raced this kind of year and I've got a daughter and fiancee at home. It's really hard to be this far away for this long, but when you've got a good group of people like I am with, I couldn't ask for anything more."